It can be a touchy moment: You notice changes in a loved one’s cognitive abilities, want to suggest screening for possible memory deficit, but aren’t sure how to go about doing that. If that sounds like a situation you’ll be in soon, read on. The entire family should consult with a healthcare professional to bring up the subject of a memory screening. When a caregiver suggests to an older family member that they have their memory evaluated, the loved one often responds with fear, denial or even hostility. It’s a very difficult issue for older people and it’s important to choose the right way to talk about it. It’s important to realize that a proper diagnosis of Alzheimer’s disease is a multi-step process that requires testing administered by a trained neurologist. A memory screening is only an initial step in this process. In addition, not all people with Alzheimer’s have a significant memory problems in the early stages of the disease. Alzheimer’s can begin with language problems and problems with day to day functioning. According to Arends, when mentioning a memory screening—a series of questions and tasks that detect impairments in memory and thinking—it’s best to accentuate the positive. Explain to your loved one that finding memory problems early increases the chances of better care if dementia or Alzheimer’s disease is diagnosed. “The earlier you intervene in this condition, both medically and with cognitive therapy, the better your chance of slowing the symptoms and achieving a better quality of life,” Arends says. When should you suggest a memory evaluation? Observe the loved one’s behavior. When their faltering memory causes problems finding words, a detachment from people, irritability, confusion, forgotten appointments or difficulty with everyday affairs such as grocery shopping, cooking or paying bills, it’s time to broach the subject. Ultimately, a family should rely on gut instinct—they know their loved one better than anyone else. Caregiver One-to-One: This method can be ineffective, even when a trusted family caregiver broaches the subject in a non-threatening way. The loved one may fear that the screening will reveal memory problems and lead to a loss of independence, and thus respond negatively. Crisis intervention: This method is used when a life-threatening situation such as a fall or injury occurs. After emergency medical technicians transport the loved one to a medical facility, physicians explain that the loved one needs more help than the family caretaker can provide. If the loved one agrees, the family can consider an assisted-living or skilled nursing facility. Involving a medical or mental health professional: This approach works best. 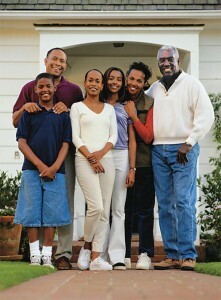 The family meets with the loved one along with their primary care doctor, neurologist or psychologist. The medical professional recommends, for example, that the loved one isn’t able to drive a car anymore. Since the statement comes from an objective expert—and not a family member—the loved one is more likely to accept it. The entire family can listen to the recommendations together and ask their loved one to have a memory screening. Don’t isolate yourself: If your loved one is evaluated and diagnosed with Alzheimer’s disease, contact a support group, such as Facebook: Alzheimer’s and Dementia Support Group. You can find a support group in your area by clicking on Alzheimer’s Resources. Find a safe place: The loved one should have a safe place to go to talk about the situation. Contact an experienced therapist or caregiver who thoroughly understands this issue and will allow your loved one to express any feelings about the suspected memory loss. Make lifestyle changes: If Alzheimer’s disease is diagnosed early, medications and other lifestyle changes such as improved diet, managing other medical problems well, preserving social connections, remaining physically active and treating psychiatric problems such as depression can increase chances of a higher quality of life. Caregiver, take care of yourself: A caregiver who is anxious and fearful can’t provide effective care to a loved one in need of stability and reassurance. A caregiver must take time to nurture mind, body and soul. When the caregiver feels confident, optimistic and at peace, the loved one who is facing the difficult issue of memory loss will tend to feel the same way. Do you have a question you would like to ask the experts at the Fisher Center for Alzheimer’s Research Foundation? If so, please call 1-800-ALZINFO, visit ALZinfo.org or send surface mail to Fisher Center for Alzheimer’s Research Foundation, 110 East 42nd Street, 16th Floor, New York, NY 10017, or e-mail info@alzinfo.org. Source: www.ALZinfo.org. 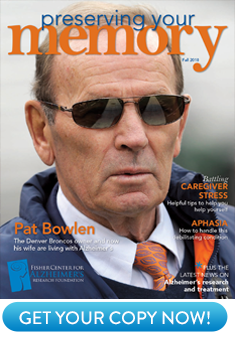 Author: Kevin Gault, Preserving Your Memory: The Magazine of Health and Hope; Fall 2010.